It’s been 13 years since I put up the first makeshift, early-html MGD website, so an update was long overdue. This new version is more efficient and has a shopping cart facility, so navigation and purchasing should be much more straightforward. Because of continually rising Canada Post rates, I’ve been forced to charge shipping separately instead of the cost being included in the price of the sheet, as was previously the case. However to help offset this I’ve reduced the prices of all of my sheets, and the shipping is a simple flat fee based on your location, so that should simplify things. If you’re a Canadian customer the 5% GST will be automatically added when you check-out. All prices on the site are in Canadian Dollars (CAD), again the Paypal check-out system will automatically handle any necessary currency conversions. I’ve attached photos of customers’ models to the relevant product pages, so if you’d like to send me pics of your work finished with Mike Grant Decals I’ll be happy to publish them. As always, thank you all for your support over the years, since my first ALPS-printed Canadian AF BAe Hawk 100 sheet went on sale back in 2001– no longer available, BTW! 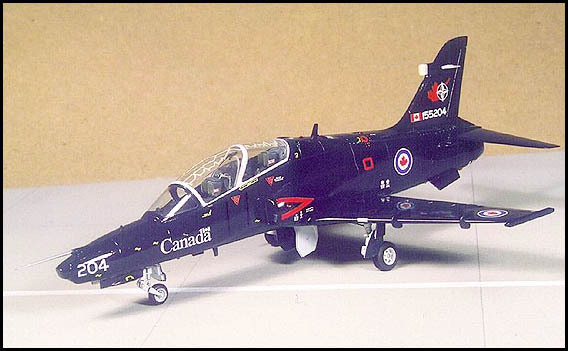 Geoff McDonnell built this Canadian version of the Hawk from the 1/72 Italeri kit, using decals from Mike Grant Decals’ first-ever release.